A standard identification of the three horns introduced in Daniel 7:8 has been the Ostrogoths, Vandals, and Heruli. As it turns out, this is not the best view historically. Often the three horns are identified as the three Arian tribes among the Germanic invaders of the Roman empire, implying that there were only three Arian groups. In reality, nearly all of the Barbarian nations to invade the Roman empire were Arian. The two notable exceptions were the Franks and the Anglo-Saxons, both of which were still pagan when they arrived. 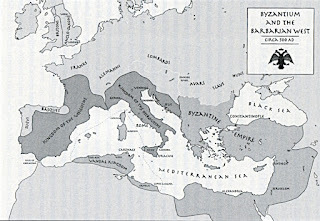 Considering that as many as eight of the commonly listed Barbarian nations were probably Arian, the three are not unique on that count alone. A map of the year 500 will be of help to us. The three major Barbarian kingdoms that at that time controlled the territory of the former western Roman Empire were the Visigoths, Vandals, and Ostrogoths. The elimination of these three was essential to the supremacy of the papacy. The following is a quote from the Biblical Research Institute Release #7, Historical Confirmation of Prophetic Periods, by Heinz Schaidinger, May 2010. "I do not favour the Heruli as one of the three uprooted powers for the following reasons: (1) It was not the tribe of the Heruli that was destroyed by Theoderic's murder of Odoacer. Odoacer was partly of Herulian descent, true; yet, his soldiers were mercenaries coming from many tribes. There was no such thing as a 'Herulian kingdom'. (2) The fight between Theoderic and Odoacer had nothing to do with the Roman pontiff. The papacy did not gain anything out of the change of rulership from Odoacer to Theoderic."